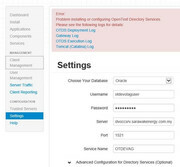 Problem installing or configuring OpenText Directory Services. INFO: A warning about POST requests is expected due to jsonp filtering, and can be safely ignored. WARNING: A servlet request, to the URI http://vmfp-oclipse.opentext.net/gateway/v1/setup, contains form parameters in the request body but the request body has been consumed by the servlet or a servlet filter accessing the request parameters. Only resource methods using @FormParam will work as expected. Resource methods consuming the request body by other means will not work as expected. INFO: Closing persistence context for OTAG so it can be safely redeployed. I see the OTAG resource created in OTDS, but not the otag user partition. Creating the otag user partition by hand leads to an error that a partition with the specified name already exists. How should I continue investigating this problem? Thanks! OTDS 10.5 Patch 2 introduced an incompatibility with the AppWorks Gateway setup. Currently, the AppWorks Gateway must be setup to use OTDS 10.5 or 10.5 Patch 1 PRIOR to applying Patch 2. We will be releasing a new version of the AppWorks Gateway which solves this problem shortly and will post to the forum when it becomes available via the downloads page. Posted Feb 20 '14 at 09:54 by Alex Jewell. Newbie question: how do I know which OTDS 10.5 I have with the AppWorks Gateway that's currently available for download? Posted Feb 28 '14 at 13:48 by James An. Any uypdate on the new version of the gateway that will resolve this issue? I need to add Tempo Box to an existing OTDS 10.5 Patch 2 environment and am unabel to proceed until this is fixed. Posted Mar 27 '14 at 16:32 by Mike Brigham. Hi, Any ETA for AppWorks Gateway new version that supports OTDS 10.5 p2? Posted Apr 01 '14 at 08:48 by Uldis Silovs. The patch for AppWorks (1.1.6) is currently being processed for release. It should be available for download within the next 2 weeks. Posted Apr 11 '14 at 08:47 by Alex Jewell. I am having a likely error with OTAG using OTCS resource in OTDS. After the settings, when I click on "Save Changes", the partition is created in OTDS but the message error "Probelm Installing or Configuring OTDS" is diplayed. OTDS is installed on a server different from OTCS server and from OTAG server. Could you please help? Thanks a lot. WARNING: A servlet request, to the URI http://server:port/gateway/v1/setup, contains form parameters in the request body but the request body has been consumed by the servlet or a servlet filter accessing the request parameters. Only resource methods using @FormParam will work as expected. Resource methods consuming the request body by other means will not work as expected. Posted Nov 06 '14 at 21:02 by Alvine AGBO.